about the glories of the Supreme Lord, no one can understand Him. When a disciple hears from his spiritual master about the science of Krsna consciousness, it is not a whimsical exchange. A bona fide spiritual master has in turn heard from his own guru in an age-old chain of disciplic succession. 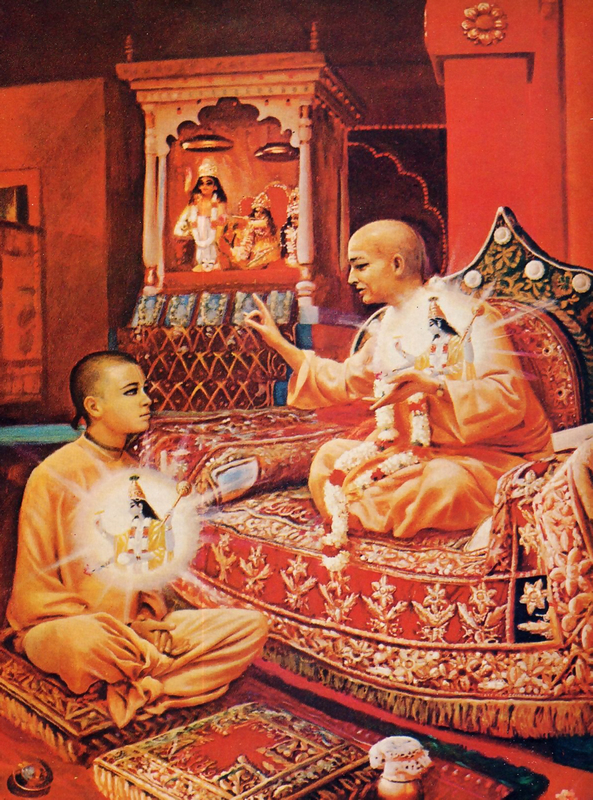 And the message of the disciplic succession is confirmed by the Supersoul, a manifestation of Krsna who is present in the heart of both the spiritual master and the disciple. 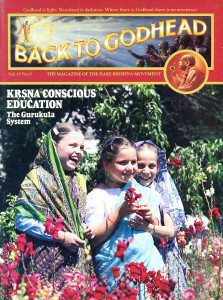 Here Lord Krsna is saying that nobody knows Him. Even the demigods on higher planets, who are more intelligent and more advanced than human beings, do not know Krsna. Nor do the seven great sages (maharsayah), whose planet is near the polestar. They also do not know Him. Why don’t the demigods and sages know Krsna? He explains, aham adir hi devanam maharsinam ca sarvasah: “Because I am the source of all these demigods and sages.” Krsna is the father of everyone. And that means He is the origin of this universe. The Srimad-Bhagavatam very nicely describes how this universe took shape, how Brahma was created, how from Brahma the rsis [sages] were created, and how the general population increased. These descriptions are there. So, Lord Krsna is the origin of everything. As it is said in the Vedanta-sutra, janmady asya yatah: “Everything is emanating from Him.” This means He is also the origin of the Paramatma (the Supersoul) and the brahmajyoti (His impersonal effulgence). Krsna confirms this here by the word sarvasah, which indicates, “I am the supreme source of anything you have any conception of.” Therefore He is very great, the source of everything. But if the Supreme Personality of Godhead is so great that nobody knows Him, then how can He be known? If He is not known even to the demigods, if He is not known even to the great sages, then how can we know Him? Yes, we can know Him. When the Supreme Lord comes before you and reveals Himself to you, then you can know Him. You cannot know Him by utilizing your imperfect senses. Atah sri-krsna-namadi na bhaved grahyam indriyaih. Because our senses are imperfect, even though we may expand our sensual power artificially, and even though we may go on speculating for millions of years, we cannot realize the Supreme Personality of Godhead. But, sevonmukhe hi jihvadau svayam eva sphuraty adah: When you adopt a submissive attitude and you chant the holy names of the Lord, then you can know Him. The word jihvadau means that God realization begins with the tongue. The tongue’s function is to eat and to vibrate sound. So we have to engage in these two processes: vibrating Hare Krsna, Hare Krsna, Krsna Krsna, Hare Hare/ Hare Rama, Hare Rama, Rama Rama, Hare Hare, and eating krsna-prasadam [food offered to Krsna]. You cannot allow your tongue to taste anything and everything. If you can control your tongue by eating krsna-prasadam, and if you engage your tongue in vibrating the transcendental sound “Hare Krsna,” then one day Krsna will reveal Himself to You—simply by this submissive process of surrendering your tongue to the Supreme Personality of Godhead. By controlling the tongue, you control all the other senses. And if you cannot control your tongue, then you cannot control any of your other senses. So the first and foremost thing is that you have to control your tongue. Don’t allow your tongue to taste everything and anything. Krsna has given us so many nice preparations. The day before yesterday we had feasting here. Everybody tasted the delicious prasadam—so many nice preparations. Our tongue is very fastidious: it wants to taste this and that. Therefore Krsna is so kind that He gives us varieties of prasadam so we can taste them and satisfy our desire and at the same time become spiritually advanced. This is a nice process. This process is not very hard. Everyone can prepare the foodstuffs and offer them to Krsna and then partake of them with family members and friends. Then you can all sit down before a picture of Krsna and chant Hare Krsna, Hare Krsna, Krsna Krsna, Hare Hare/ Hare Rama, Hare Rama, Rama Rama, Hare Hare. In this way you can live a pure life. Just try it and see the result. If every person in every home takes to this principle of understanding Krsna, the whole world will become Vaikuntha. Vaikuntha is the place where there is no anxiety. (Vai means “without,” and kuntha means “anxiety.”) Now this world is full of anxiety because we have accepted this temporary existence of material life as all in all. But it is just the opposite in Vaikuntha, the spiritual world. We all want to be free from anxieties, but no one knows how. Taking shelter of intoxication is not how to get oneself free from anxieties. The drug simply produces oblivion. For some time you forget everything, but when you come to your consciousness again the same anxieties are there. So this process will not help you. If you want to be free from anxieties, if you actually want life eternal, full of bliss and knowledge, then you have to understand Krsna. And this is possible only by serving Him, beginning with your tongue. Then, namanta eva: “Just become submissive.” Just acknowledge that your senses are limited. You are subordinate even to material nature, what to speak of God. Everyone is subordinate to the control of the Supreme Lord (mayadhyaksena prakrtih suyate sa-caracaram). Nobody can be equal to or greater than God. Therefore your qualification for knowing Him is to be submissive. Don’t waste your time speculating. Be submissive. Then the verse says, san-mukharitam bhavadiya-vartam: “Try to hear about the glories of the Supreme Lord from the mouths of realized souls.” Don’t go to unauthorized persons for spiritual instruction. How can you know the difference between an unauthorized and an authorized person? This is described in the Bhagavad-gita. The Lord says, evam parampara-praptam: “This authority is handed down by disciplic succession.” In the Bhagavad-gita Krsna hands the authority down to Arjuna, who understands Krsna to be the Supreme Absolute Truth (param brahma param dhama pavitram paramam bhavan). So if we follow Arjuna’s process and try to understand Krsna as Arjuna understood, then we can know who is a genuine authority. It is not very difficult to understand who a genuine authority is. So, you have to search out that genuine spiritual authority. That’s all. You have to find him and remain in your present situation and try to hear submissively from him. And as soon as you become submissive and hear from a genuine spiritual authority, then svayam eva sphuraty adah: Krsna will begin to reveal Himself to you. God is always ready to reveal Himself to you. But how does He reveal Himself? He reveals Himself as soon as you become submissive, become a devotee, become Krsna conscious, and follow the path traversed by the great devotees and spiritual masters. Then everything will be known to you. Although Krsna is not known even to the demigods and great sages, He can be known to you at your home. Although He is unconquerable, if you adopt this process you can conquer Him. You have only to adopt the process. Otherwise you cannot know Him; there is no alternative. You will understand that Krsna is ajam [unborn] and anadi [beginningless]. He is the cause of all causes; He is not caused by any other cause (sarva-karana-karanam). So to understand Krsna, the Supreme Lord, is first of all to be thoroughly convinced that He is the cause of all causes. Then. sarva-loka-mahesvaram: Krsna is the supreme proprietor and master of all planets, both in this material world and in the spiritual world. Then, asammudhah: You will become unbewildered about God. You should not accept blindly. God has given you the power of reasoning and argument. But don’t argue falsely. The process of reasoning is also mentioned in the Bhagavad-gita: tad viddhi pranipatena pariprasnena sevaya. If you want to understand the transcendental science, you have to follow this principle—you have to surrender. This is the same thing that was mentioned in the Bhagavatam verse as namanta eva, to become submissive. Unless you become submissive, you cannot be a surrendered soul. And surrendering to a genuine spiritual authority is the first qualification for understanding the Absolute Truth. Now, where will you find that person about whom you can say, “Here is a person to whom I can surrender?” This much knowledge you must have. Don’t surrender to any nonsense. How to tell the genuine spiritual authority from the nonsense is mentioned in the Mundaka Upanisad [1.2.12]: tad-vijnanartham sa gurum evabhigacchet . . . srotriyam brahma-nistham. This word srotriyam means “one who is in disciplic succession.” And what is the proof that he has come in the disciplic succession? Brahma-nistham: he is fully absorbed in serving the Supreme Absolute Truth, the Personality of Godhead. So, if you find such an authoritative person, surrender to him without reservation. Surrendering unto him means surrendering unto God, because he is God’s representative. But you are allowed to make inquiries—not to waste time, but for understanding. And you should try to serve him and please him. Then Krsna will reveal Himself to you. This is the process. So, the whole process of self-realization is given in the Vedic scripture. You have only to adopt it. But if you don’t adopt the process and simply waste your time with intoxication and speculation and all kinds of nonsensical activities, then you’ll never understand God. As Lord Krsna says here, God is not understandable even by the demigods and the great sages, what to speak of by us with our teeny efforts. Now, what is the process? We chant Hare Krsna and hear nice musical sounds and eat krsna-prasadam and study Bhagavad-gita philosophy. Is it very difficult? Not at all. And by this process you’ll become asammudhah, unbewildered. Nobody will be able to cheat you. But if you want to be cheated, there are so many cheaters ready to give you some bogus process and take your money and go away. So don’t be a part of this civilization of the cheaters and the cheated. Just follow the process of Krsna consciousness as it is given by the system of disciplic succession, as it is prescribed in the Vedic literature, as it is recommended by Krsna. Try to understand this science from the authoritative source, and try to apply it in your life. Then you will make spiritual progress without a doubt (asammudhah sa martyesu). The word martya means “those who are destined to die.” Who are they? All conditioned souls, beginning from Brahma and going down to the insignificant ant—they are all martya, they will all die. So among the dying mortals you will become the most intelligent. Why? Sarva-papaih pramucyate. You will be free from all kinds of reactions to your sinful activities. In this material world we are always committing sinful acts, knowingly and unknowingly. So we have to get free of the reactions. How? By surrendering to Krsna and His authorized representative, the spiritual master. Then, sarva-papaih pramucyate: you become free of all reactions to your sinful activities. This is the process. And if you adopt this process, ultimately you can get in touch with Krsna, and your life becomes successful. This process is very simple and sublime, and everyone should adopt it.